Topaz has a new format-"Topaz Labs", with lots of interesting choices in the "artsy" selections. I liked this one, with a few of my own tweaks. 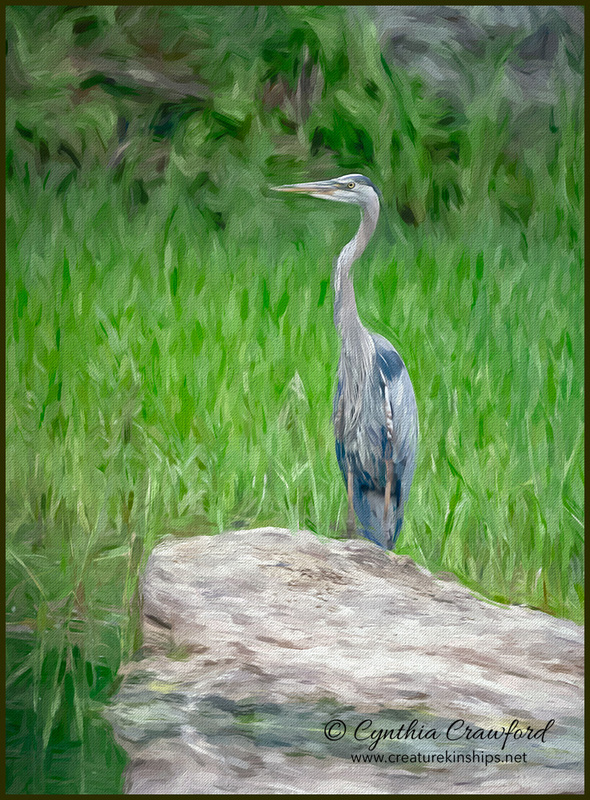 This Heron was standing at attention in a nearby beaver pond. A beautiful painterly presentation, Cindy! Great texture in the brush strokes, yet good detail maintained within the lovely Heron. The reflection at the bottom anchors the image – terrific work. This looks like a great addition to the Topaz choices, Cindy! - Certainly in your very capable hands. Lovely, natural working of the grasses and heron plumage, resulting in a very appealing painting. Beautifully done! A beautiful image that could easily pass for a painting. Love the canvas look.